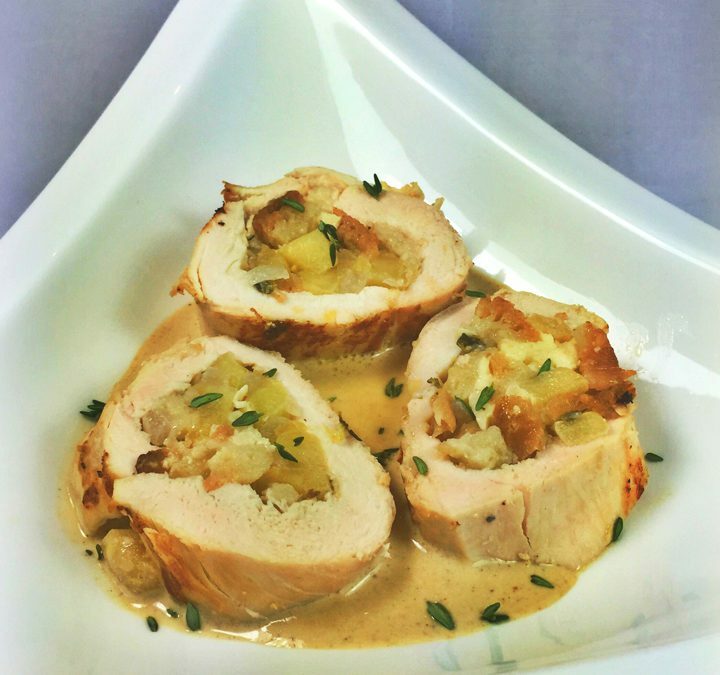 When fall is in the air, the perfect dinner menu becomes chicken breasts stuffed with delicious apples and seasoned with cider and thyme. We added a creamy mustard and cider sauce to make this seasonal dinner complete. Perfect for a cool, cozy night at home or a dinner party with friends. If you have not butterflied chicken breasts before, most store butchers will be happy to either show you or do it for you. We offer two preparation methods for this recipe – oven or sous-vide. Boiled cider can be purchased from King Arthur Foods (kingarthurflour.com), or you can make your own by placing 3 cups of unfiltered apple cider into a saucepan. Cook over medium-high heat at a hard simmer reducing the cider to 1-1/2 cups. If using the oven method, preheat the oven to 350 degrees. If using the Sous Vide method, preheat a water bath to 140 degrees. In a 12” sauté pan over medium heat, melt the butter. Add the onion and sauté until the edges of the onions are getting soft, about 5 minutes. Add the apple and 1 ½ teaspoons of fresh thyme, then continue to sauté for another 5 minutes until the apples are soft. Turn off the heat and add the diced bread, stirring into the apples and onions. In a small measuring cup mix ¼ cup of chicken stock, lemon juice, and 2 tablespoons boiled cider. Pour over the bread mixture and stir in. Sprinkle the lemon zest, ¼ teaspoon salt, and ⅛ teaspoon fresh ground black pepper over the stuffing; gently stir to combine. Push the bread down in the liquid and set aside to cool slightly, so the liquid absorbs into the bread. Lay a piece of plastic cling wrap over a cutting board. Place one chicken breast on the plastic and cover with another piece of plastic cling wrap. Pound the thicker areas until the breast is an even thickness. Remove the top plastic wrap and sprinkle a pinch of salt on the chicken breasts. In the center of the chicken breast, spread ¼ of the stuffing, leaving a ½ inch border. Using the plastic, roll the breast up together, discard the plastic wrap, then tie with butcher’s twine. Repeat for the other three chicken breasts. Using the Oven method: Heat a 12” sauté pan to very hot. Season the outside of the chicken with kosher salt. Add one tablespoon of olive oil and sear the breasts in a single layer on all sides, about one minute per each side. Cover with foil and place in the oven. Bake for 45 minutes or until the internal temperature reaches 160 degrees. Carefully remove the sauté pan from the oven; place the chicken breast on a heatproof surface and cover with foil to keep warm. Place the sauté pan back over medium heat to make the sauce. Using Sous Vide method: Place a chicken breast in a vacuum bag and seal. Or put in a zip-top bag and use the water displacement method. Repeat with the other chicken breasts. Cook in a 140 degrees water bath for 2 hours. When finished, remove from the bags and dry with paper towels. Season the outside of the chicken with kosher salt. Heat a 12” sauté pan to very hot, add one tablespoon of olive oil and sear the breasts on all sides, about one minute per each side. Remove from the sauté pan and cover with foil. Place the sauté pan back over medium heat to make the sauce. To make the Mustard and Cider Sauce: Add 2 tablespoons of Brandy or Calvados to the sauté pan and, with a flat-sided wooden spoon, loosen and scrape up all the brown bits stuck to the bottom of the sauté pan. Right before the Brandy evaporates, add 1 cup of chicken stock. Continue to stir until all the brown bits have dissolved. Increase the heat and cook at a high simmer until the liquid reduces by half. Pour through a fine mesh strainer to remove any solid pieces. Wipe out the skillet, and add the strained liquid back into the pan. Reduce the heat to low and add 2 tablespoons of boiled cider, 1 tablespoon of Dijon mustard and whisk to dissolve. Add one cup of cream and whisk to incorporate the cream into the sauce. Heat for five minutes or until the sauce is starting to bubble. Remove the butcher’s twine and cut the chicken breasts into slices and serve with the sauce, topped with the remaining fresh thyme. To make boiled cider -Place 3 cups of unfiltered apple cider into a saucepan. Cook over medium-high heat at a hard simmer until reduce to 1-1/2 cups.